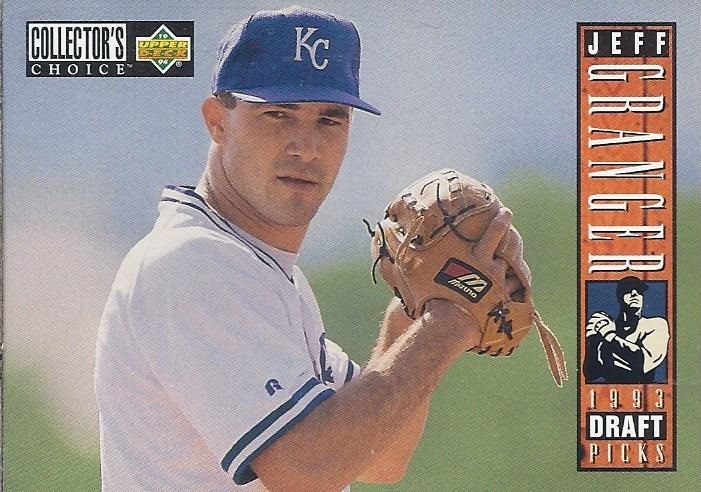 Front photo: Despite the fact he debuted with the Royals in 1993, it is still a posed shot. But, that debut consisted of one inning and an ERA of 27.00. Back photo: And another one. Better photo? : A bland draw. Ties to my personal collections: None that I can see. Wiki-facts: If I ever get a wikipedia page, I don't want the words "cautionary tale" to appear on it. Unfortunately for Jeff, those words do appear in relation to his being rushed to the majors. On a better note, he was also a quarterback at high school and at Texas A&M. Google it: There is another Jeff Granger that shows up in two other links prior to this Granger. 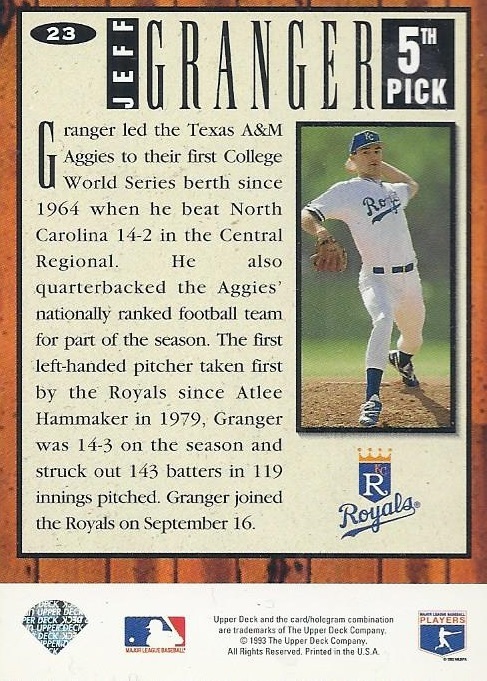 No matter how bad the cautionary tale is for the baseball Jeff Granger, at least the first three words in an article about him don't contain the phrase "Corrupt tax auditor". 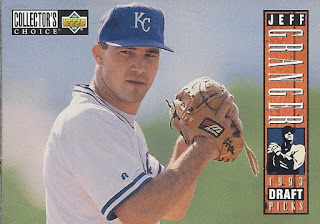 How was his strike-shortened 1994? Had two games in the bigs, both starts. Went 0-1 with a 6.75 ERA. Birthday boy: December 16, 1971. Both the Bangladesh Liberation War and Indo-Pakistani Wars of 1971 ended on that date. Michael McCary of Boyz II Men was born that date. Nobody else on other sports reference sites has that exact birthdate.